At the 2014 United Nations Climate Summit, 180 governments, companies, indigenous community networks, and civil society organizations signaled their commitment to ending deforestation by endorsing the New York Declaration on Forests, which set a goal to halve natural forest loss by 2020 and end it by 2030. Fast forward one year, and many of the Declaration’s endorsing companies are already taking concrete action to reduce their contribution to global deforestation and work toward achieving sustainable supply chains. These commitments are the focus of the most recent report of Forest Trends’ Supply Changeproject. The report, Firm Commitments: Tracking Company Endorsers of the New York Declaration on Forests, looks at public sustainability disclosures from 41 companies that endorsed the Declaration. Among all endorsers, actions by the private sector are considered especially critical to the Declaration’s ambitions because these businesses are deeply dependent on the “big four” commodities responsible for most agriculture-driven deforestation – palm oil, soy, cattle, and timber and pulp. 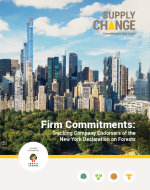 Firm Commitments was released at Climate Week NYC in September 2015. Media coverage of the report and the two official launch events can be found below.